Q: Can we really just forgive and forget? A: Yes and no. There is no weakness is forgiveness. More often than not, it is the strong who are able to forgive and the weak choose to remain resentful. In regards whether or not America can forgive Lance and Manti, I think the answer should be and has to be “yes.” While the truth of the matter is that Lance and Manti both got caught in lies, there is another truth present: I am a liar, too. Lance and Manti are liars. So am I. And if America is honest (since we are discovering that the truth will come out eventually), then we all have to admit that at some point in our lives, each and every one of us has told a “Lance.” Or told a “Manti.” In other words, we have told a lie. We may console ourselves by saying our half-truths aren’t anywhere near as severe as the lies exposed last week, but I don’t think it’s a good idea to line-up lies on a sliding scale of comparison. 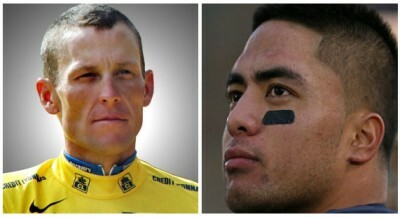 In resonating with Lance and Manti, it makes it a bit easier to offer them forgiveness. But while I argue for forgiving Lance and Manti, a part of me has a hard time with the statement “forgive and forget.” In some circumstances, forgiveness is cheapened when it is paired with forgetfulness. What if the If the U.S. Anti-Doping Agency forgave Lance Armstrong and decided to dismiss and forget about his years of drug use? Pairing forgiveness, alongside the USADA’s ruling that Lance ran “the most sophisticated, professionalized and successful doping program the sport has ever seen” (source), with forgetfulness would undermine the existence of their organization, as well as open the door for other athletes to do the same. Forgiveness means getting to a point where you can wish the other person well, but it does not necessarily mean that you completely forget their indiscretion. Moving through the steps of forgiveness can cause a relationship to change – sometimes you part ways, but sometimes the relationship is strengthened for the better. We are all flawed, in some way or another. Some mistakes and missteps are bigger than others, and our ability after the fact to do or recognize the right thing and course-correct isn’t a cut-and-dry decision either. It’s hard to see things from another’s unique point of view, and even more difficult to know that our perspective on their actions is, itself, correct or even appropriate. Best thing I can think to do is stay true to what I believe, understand and stick to my values, and learn from what I see around me (including experiences from other flawed people) to constantly try to make myself better. https://thinkspace.com/wp-content/uploads/2013/11/website-thinkspace-logo-teal-155x69.png 0 0 Annie Duncan https://thinkspace.com/wp-content/uploads/2013/11/website-thinkspace-logo-teal-155x69.png Annie Duncan2013-01-24 09:00:372013-01-24 09:00:42Q: Can we really just forgive and forget? A: Yes and no. Big lies, small lies, white versus blue collar crime. It’s is all bad. Both Manti and Lance created pain for the people around them. Pain to their families and friends. If you compare the size of the problems created Lance created incredible pain and destruction. The good that Lance created around Livestrong on the outside may have been nothing more than another avenue to feed his ego and also boost his value in his sponsors eyes. What happened with Lance is a tragedy, his admittance is a first step, if he makes an attempt to apologize to every single person he hurt (even if it looks impossible), and he shows real change then perhaps he will be forgiven by people. Coming clean — admitting his lies and having his family and children know what he did was wrong is about as raw as it gets. Now he gets to rebuild. The thing that I can take away from this is that when I examine myself and look at the things that I’ve done wrong I find myself needing more grace and also be one to extend more grace to others. I appreciate and am inspired by your take-away from this – “needing more grace and also be one to extend more grace.” I think that is where the balance should be, and know that at times I am shortsighted and only see how I need more grace. Great post Annie. As far as Lance Armstrong, I still like the guy. The way I’ve heard it explained is, everyone was doping, so the playing field was level. I don’t know. I still think he’s an amazing athlete and has done so much good. Matt made a good point too, it’s hard to see things from another’s unique view. Our life experiences shape how we see the world. The way we were raised, our schooling, our travels, everything goes in as a factor to how we view situations. I say after viewing multiples sides of a story decide how you feel. Be open and realize we’re human…or blame it on user error, that’s what I do. So… if Lance didn’t win the Tour de France several times and didnt start a cancer foundation but was just an average joe that got caught doping in the biggest professional drug doping scheme in history – would you give him the same “pass” on his illegal use of drugs? Would you feel the same if he had failed? I doubt it. The ends cannot justify the means. I’ve used this excuse before and its a cheap cover for known bad behavior – and is usually employed when the “ends” have the appearance of being positive. I believe he should be punished. He is a disgrace to all those athletes that try and fail without “leveling the playing field”. He’s a bad role model. His fall from grace is a lesson for us all. He might eventually be forgiven for his stupidity and lies, but his punishment should not be forgiven and what he did should never be forgotten. Good post Annie. Interestingly, we’ve had a parallel discussion related to Medical Ethics recently. Thanks for posting. Thanks for your response and insight, Howard. It is an interesting question to ask if we would feel the same towards Lance if even despite his doping and efforts, he failed. You are completely right – in no circumstance to the ends justify the means. If you start with corruption, then the result will be corrupted (even when it looks like a fancy yellow jersey). John F. Kennedy. He had multiple affairs while in office. He seduced interns, abused his power, and cheated on his wife Jackie, oh and set a poor example for his children. While adultery isn’t illegal everywhere, it’s still an awful thing. However many Americans still think very highly of JFK and his accomplishments. If you’re going to put Lance through the ringer will you hold EVERYONE to that same standard. Also athletes have been pushed to this point. We as a society have created an industry (the sports arena) that wants bigger, faster, and stronger. Our desire to watch people compete has molded how athletes must train to keep up. Compare the form of gymnasts from the 1970’s to the gymnasts of today. Their bodies are completely different. How’s your [think]space? Thinkspace in Fremont, Seattle we need your support!